Homo Deus, Yuval Noah Harari’s second Book is all about Tomorrow. In ‘Sapiens’ he took from Yesterday to Now and Homo Deus takes us from Now to our many Tomorrows. While both books are independently readable, I think to get the true essence and the premise of Yuval’s arguments we need to read both the books. ‘Sapiens’ in my opinion was trying to break some of the conclusions we have of our kind and make us question the ground we stand. To be open when we call our turf the ‘only true’ one, because we might not be all that right. In Homo Deus it is all about looking at the recent advancements and look at what would our Kind be in the coming days. When technology and Data and collaboration and advancements through the synergy of biology and technology all are shaping the way we are functioning, we might need to think deep into our World Views. Think about what it means to be Human. Question when we hear ourselves say that we know more about us than anyone else. 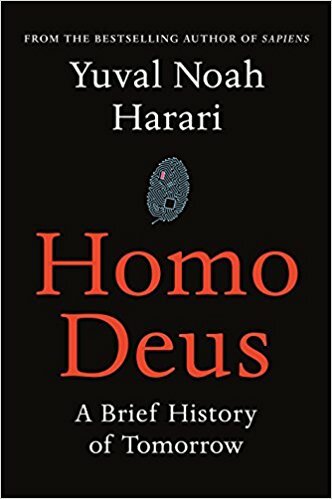 If you have read Sapiens, I request you to read Homo Deus, because unless you read that, you will not fully plugged in to acknowledge the breadth of the arguments. When I started reading Homo Deus, I did it as Yuval asked us to; As a brief history of tomorrow. But as I finished the book I had to start thinking if Yuval should have been more specific by saying ‘Our Tomorrow’ instead of just tomorrow. Because the book will make you more connected to the possibility of a new breed of ‘They’ who are not really ‘Us’… And whose Tomorrow we might be incapable of writing now because we don’t know how they will function and see our views of the world 🙂 ….. Interesting Piece… and seems pretty near…. We will acknowledge or have to or might be forced to acknowledge algorithms that will not be conscious but extremely intelligent to make sense of the world we live in. Because once Intelligence and consciousness are decoupled much of the system will be run by intelligence. Where will conscious beings as we call ourselves stand 🙂 And to that add the gamut of upgraded Conscious Beings may be…..